This 1920s Beachside Clyde Adult Mens Costume will have you sunbathing like the olden days in the turn of the century. 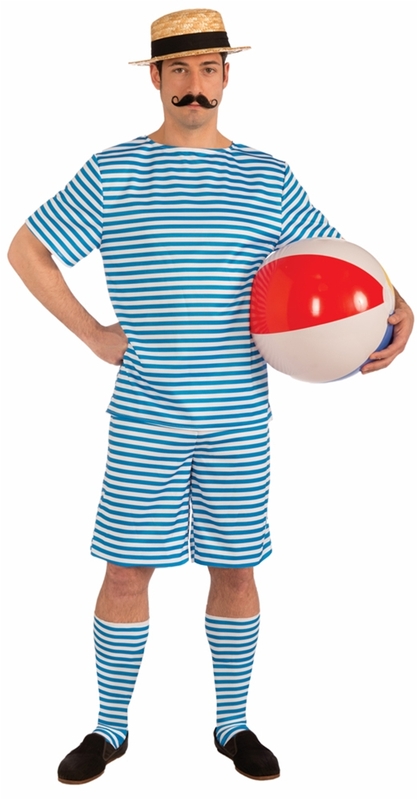 This vintage bathing suit costume includes a blue and white striped top, matching shorts, and socks. You'll have fun dressing up in this 1920s bathing suit costume that is perfect for any Halloween celebration or 1920s themed party. Pair this costume with our 1920s Beachside Bettie Adult Womens Costume to create the ultimate Halloween couples costume! Hand wash with cold water and mild detergent. Dry flat. Do not bleach. Do not iron. Hat, mustache, shoes, and ball.